BEN SHERMAN MENS RETRO SIXTIES TONAL GINGHAM SHAWL LAPEL TAILORED MOD DINNER SUIT (Peacoat) - Camden Tailored Skinny Fit. Borrowing certain subtleties from the refined Victorian era dinner suits, this Ben Sherman Tailoring Mod Camden Slim Fit Suit features Vintage satin shawl lapel and fab Sixties tonal gingham check to the main body. One button fasten and perfect for the party season. Ben Sherman Tailoring Shawl Lapel Tonal Gingham Retro Dinner Suit. Mens peacoat blue tailored Mod one button, single breasted dinner suit with Retro Sixties satin rounded shawl lapels. Tonal gingham check weave throughout the body. 4 button non-working cuffs, Retro flap hand pockets, contrast lining, side vents. Ben Sherman Tailoring Camden Skinny Fit cut for that sophisticated and sharp Mod look. Flat front Retro trousers to match with Mod button down pockets to reverse, slant pockets to front and slim leg. Double clasp waistband, button detail and zip fly. Classic belt loops. 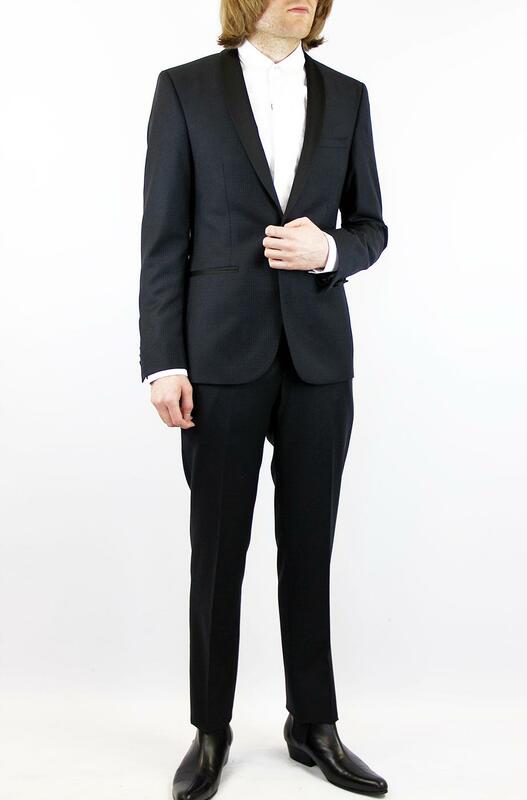 Ben Sherman Tailoring one button dinner suit. BEN SHERMAN TAILORING MENS RETRO SIXTIES MOD TONAL GINGHAM SHAWL COLLAR DINNER SUIT. MENS RETRO SIXTIES MOD TONAL GINGHAM SHAWL COLLAR DINNER SUIT by BEN SHERMAN TAILORING - Mens peacoat blue Retro tonal gingham check dinner suit with rounded shawl satin lapel in contrast black. Tailored Mod Camden fit, one button fasten single breasted suit. Two flap pockets to sides, left breast pocket. Side vents, 4 button non-working cuffs, contrast lining. Retro flat front trousers to match. Tonal gingham check, slim Mod cut, button down pockets to reverse and two slant pockets to front. Clasp waistband, concealed button detail and zip fly. SKU: MF08092J / MG08092T Ben Sherman Tailoring One Button Shawl Collar Tonal Gingham Suit. BEN SHERMAN TAILORING Mens Retro Sixties Mod One Button Single Breasted Dinner Suit. Tonal Gingham Check with Shawl Collar. Choose chest and waist size to fit. Listed as a set. General rule of thumb is waist size is 6 inches less than the chest size e.g. 36 chest with a 30 inch trouser.